Uber CEO Travis Kalanick and Baidu CEO Robin Li shake hands to seal the deal. Smarting from a string of black eyes this month, Uber has scored a major win in China. The fast growing car sharing service Uber said Wednesday that it had inked a deal with China's leading search engine Baidu (BIDU). 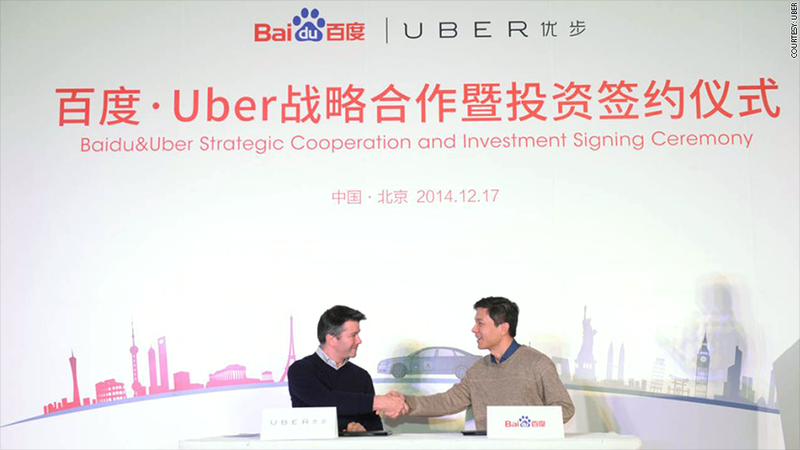 The agreement means Uber will be able to use Baidu's mapping and mobile technology. Both are key technology that Uber needs to connect drivers and riders via its popular smartphone app. Baidu has 500 million active mobile users each month. It will also invest an undisclosed amount in Uber, the companies said in a release. The deal comes as Uber's global expansion has run into roadblocks in Europe and Asia. Just this week, the French government announced plans to ban an Uber subsidiary next month. It was banned in New Delhi and faces scrutiny in Netherlands and Thailand. And in Australia, Uber came under fire for charging passengers inflated prices during a hostage crisis in Sydney earlier this week. Despite all of these reputational issues, Uber has been a hot investment. And Baidu isn't alone. Uber recently closed a $1.2 billion round of funding, which it says will be used to fuel its expansion in the Asia, among other things. The privately-held Uber is valued at a whopping $40 billion. Uber currently operates in 250 cities around the world. It already has operations in nine Chinese cities, where it faces stiff competition from rival taxi apps Didi Dache and Kuaidi Dache. But Uber views the world's most populous nation as a major growth opportunity.